When Kenny & Company came out in 1976, it barely registered at the box office. However, it would soon usher in a host of other "kids" films, namely E.T. the Extra-Terrestrial (1982), Stand By Me (1986) and all of the John Hughes movies from that era as well. These films had bigger budgets, studio muscle behind them, and they were able to stick around long enough to find their audience. Kenny & Company didn't have this luxury. And, while it did have a nice DVD release via Anchor Bay (remember them?) in 2005, the film has essentially been forgotten. I first watched Don Coscarelli's Kenny & Company on a Sunday evening. I don't recall what grade I was in or how old I was, but something about this tale of 3 friends (Kenny (Dan McCann), Doug (A. Michael Baldwin) and Sherman (Jeff Roth)) hanging out around Halloween stayed with me. It would be many years later but I would connect with this film again (most likely on VHS), and it almost was like the lords of cinema were conspiring to keep this film in my world. The image of a kid jumping through a window at the end of the movie was something that never left my mind. Having spent a summer watching The Beastmaster (I never knew until years later that Don Coscarelli made that film and Kenny & Company), I am fairly certain that I watched the tale of Dar and his animal buddies battling the forces of evil at least a few years before I watched the coming of age tale that is Kenny & Company. In fact, I watched Phantasm well before I saw any of these films. I was so disturbed at such a young age, by that tale of horror that I went out of my way to forget about it. Many years later, after the death of my mother, I reconnected with Phantasm. Its deep-dive look at death via the exploitation genre of the horror film was a revelation. I finally got it. So it was with this renewed vigor that I decided to take down the oeuvre of Don Coscarelli. All of this led me back to Kenny & Company. I'd heard about it all throughout the supplemental features of the Phantasm DVD. It was the film that brought Don Coscarelli and A. Michael Baldwin together. I had to see it but I didn't expect much from it. Why? Because I didn't know that it was the film I'd seen years earlier. So, once again, on a Sunday night, back when getting DVDs from Netflix was a thing, I watched/re-watched this movie. I loved it immediately. The humor, the jokes, the real moments between young people, the reverence for Halloween, etc. It was like this movie had been made specifically for me. So imagine my elation when, at the end of Kenny & Company, I saw the same kid from years before jump through the window! I had finally found this movie again. At that moment, I was determined to never let it go and to try and make sure other people could have the same Kenny & Company experience that I had. Kenny & Company deserves to be discussed with all the seminal 80s movies. 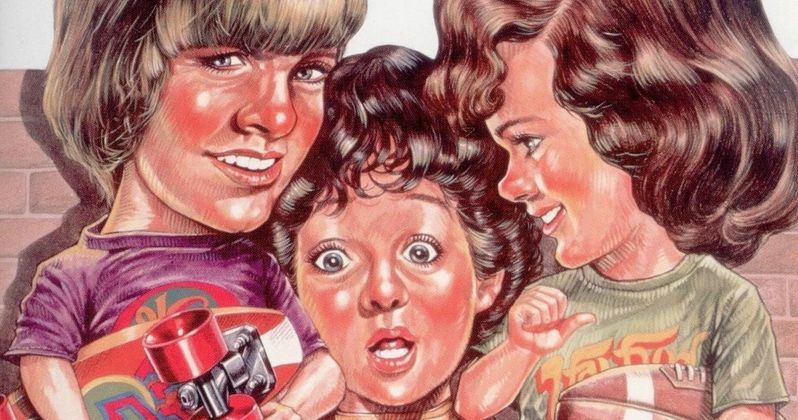 With it's coming of age themes, deep story lines, and ability to capture a special time in the lives of youth, Kenny & Company was groundbreaking. Films about teens getting into sticky situations were nothing new. The youth market had been exploited to great effect by Roger Corman and other daring filmmakers. However, many of those films lacked the nuance and subtly that Kenny & Company displayed. This story of three friends over three days moved from joyous to melancholy with equal ease. However, amidst the ups (pranks before Halloween, scooter racing, girls), there were the downs (putting Kenny's dog to sleep or witnessing a fatal auto accident). Coming out years before Over the Edge (1979), E.T. the Extra-Terrestrial and Stand By Me, Kenny & Company manages to capture all the energy, rebelliousness and depth of those films, while never resorting to some of the tropes that those films employed. For Over the Edge and Stand By Me it would be gunplay. For E.T. the Extra-Terrestrial it would be the alien itself. Make no mistake, those are all important, seminal films that deserve to be canonized. However, Kenny & Company feels realer. It's more down and dirty. Essentially, it was made by a kid as Don Coscarelli was in his early 20s when he brought Kenny & Company to the big screen. The directors of those other films were all older and thus, by proxy, their movies are wonderful but there's no denying a sense of adult detachment. The John Hughes films like Sixteen Candles (1984), Ferris Bueller's Day Off (1986), and The Breakfast Club (1985) all seem, somehow, indebted to Kenny & Company. For Sixteen Candles we see a young girl who just wants to be noticed by a special boy. In Kenny & Company we see this play out when Kenny falls in love with a girl named Marcy (Terri Kalbus -- she would go on the play the fortune teller's daughter in Phantasm). Now, it is a middle school sort of love, however it's no less poignant or important. And ultimately, how it resolves itself is a lot realer than what happens in Sixteen Candles. This isn't a contest so much as a point of fact. In Ferris Bueller's Day Off, Ferris and Co. are up against a clock. They have one day off and in that day we see it as a microcosm of seizing life. Making every moment count. Contrast that with Kenny & Company which takes place over 3 days. During this time we get the same layered look at three middle schoolers who, arguably, make the same point of carpe diem just in a different way. Lastly, there's no denying that The Breakfast Club is a very real and special film. It relies on its dialogue to drive its action. However, there's no denying that it was made by an adult. Contrast this with Kenny & Company and the realism factor in a kid's film is even more palpable. The dialogue is oftentimes stilted. It's disjointed in a way that makes it seem like the characters were actually making it up on the spot. I am not saying John Hughes or any directors watched Kenny & Company and mined it for their own cinematic purposes. I am just saying that dollar for dollar, scene for scene, Kenny & Company is just as important as many of the seminal coming-of-age films we love from the 1980s. Sadly, Kenny & Company is not really thought of when we have that discussion. Kenny & Company was too soon. Aside from Francois Truffaut's The 400 Blows (1959), Mike Nichols' The Graduate (1967), Peter Bogdanovich's The Last Picture Show (1971) and Nicholas Ray's Rebel Without A Cause (1955), there really wasn't much in the way of mass market youth films. As I mentioned, the 1970s gave us Kenny & Company and Over the Edge, but as far as coming-of-age tales about teenagers, the 1980s was where it was at. And sadly, Kenny & Company hit theaters too early for all of that. Had this been a horror film (as Phantasm was with a lot of the same characters from Kenny & Company), it would have stood a better chance of making some money at the box office as Halloween proved when it was released in 1978. Phantasm did the same in 1979. When Kenny & Company came out it was easy to forget. First of all, the year it was released it was going up against the likes of Rocky, The Omen and Taxi Driver just to name a few. So the deck was already stacked against it because these films were monsters. This didn't mean that people didn't want films about youth culture. This was the year The Bad News Bears came out after all. This now brings us to the second reason Kenny & Company was too early. It didn't have the dollars behind it to really push the film. Mostly likely 20th Century Fox, the studio that distributed Kenny & Company, didn't know what to do with it. How do you market a kid's film that isn't really a kids film? Ultimately, this got figured out with The Breakfast Club, Fast Times At Ridgemont High, The Goonies and a host of others, but the line from these films to Kenny & Company can't be denied. It just took a little longer to get there. Kenny & Company is very relevant today. All one needs to do is look at a few frames of Kenny & Company and they will see how relevant this film still is. Sure, the 1980s have come back in big way. One need only look at popular shows like The Goldbergs and Stranger Things (other properties that can probably trace their lineage back to Kenny & Company), to see that that is what people want at present. However, Kenny & Company is very much a film of the 1970s. The shaggy hairstyles, the clothing, the penny skateboards... wait, all of those things are still en vogue today! Aside from the fact that this film was actually made during that time (so things like the film stock used certainly aide in helping date it), Kenny & Company looks like it could be from today. Then there are the themes of Kenny & Company. Friendship, coming of age, first love, etc.. All of these things work together to make a film that will always be timeless. Kenny & Company is also set apart by its slice-of-life approach to its storytelling. As great as The Goldbergs, Stranger Things and 13 Reasons Why are, they are genre shows mixed with a look into the lives of younger people and their families. Kenny & Company really just focuses on the young people. Sure, their families play a role but they are not nearly as pronounced as they are in those other shows. In Kenny & Company we get real kids, figuring out their real problems and they often only have to themselves to rely on. Without Kenny & Company there is no Phantasm. This last tidbit might seem like it's a ploy for interest from from the horror fans out there. However, if you are are a fan of the movie Phantasm then you know that without Kenny & Company, director Don Coscarelli might not have come up with the idea for Phantasm. While making Kenny & Company, as it was set around Halloween, there were naturally some scary moments. When Coscarelli saw the visceral power of creating that on screen, coupled with the audience's perfectly timed reaction, he was buoyed to try and do that in a longer form. This ultimately led to him creating the first Phantasm film. This might seem like a minor point but Phantasm is arguably one of the most important horror films of the past 40 years. It's ability to be a horror movie, a meditation on death, and a film about the importance of family bonds, is only seconded by its ability to truly terrify us with the natural and supernatural. That it has gone on to create an enduring franchise of 5 (and counting) films, is simply a testament to the strengths and ideas first explored in Kenny & Company. In fact, if you watched Kenny & Company and Phantasm back to back, it might seem like one big movie. On the commentary track for Kenny & Company, A. Michael Baldwin, who plays the rambunctious Doug in the film, praises people who saw Kenny & Company as kids. He goes on to talk about how impressive it is if they later went and found the film on DVD, and he is even more impressed if users have perused the commentary track. As one of those people, it seems like a vindication of knowing just how special Kenny & Company is and now being able to share it with the world.